72-year-old, Louis S. arrived to our community, Cortlandt Healthcare, seeking physical therapy for his recent diagnosis of bronchopneumonia and muscle weakness. 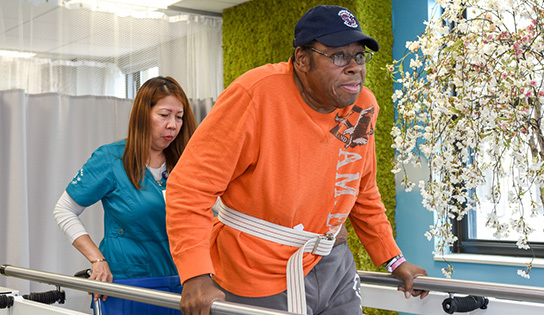 During treatment, Louis S. was in need of physical therapy six times a week, the therapy was directed at maintaining his muscle strength and balance. The initial goals that were anticipated were to safely ambulate 75 feet using a rolling walker, then to increase to 150 feet with assistance. Another goal was to successfully go up and down seven steps. If all of this was completed, Louis would have a safe discharge home. Over the next couple of weeks, therapy worked diligently with Mr. Louis S. to increase his gait and overall balance and strength. Within a few weeks, Louis was able to ambulate 250 feet with a rolling walker! As a few more weeks passed, Louis was reevaluated. It was at this time that he was able to ambulate 400 feet with a rolling walker! He not only met his goal, but exceeded it! Louis was successful in his recovery and rejuvenation and was escorted home with a smile. We are proud to be a part of his journey, and only wish him the best of luck throughout. Thank you for letting us join you on your journey, Louis!